SRX series - Juniper's latest product line all based on the JUNOS® operating system for branch office and high end enterprise. Models vary from 750 Mbps to more than 120 Gbps. Available from entry levels with high-performance to enterprise ISP class models. 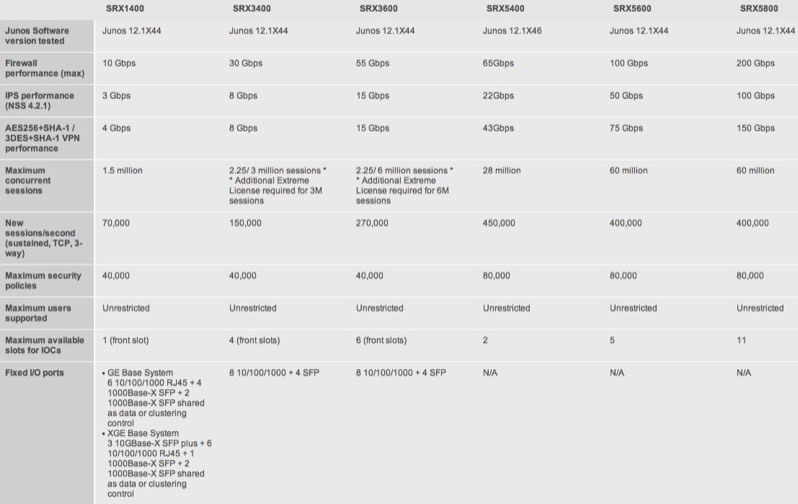 Includes SRX210, SRX240, SRX650, SRX3400, SRX3600, SRX5600 and SRX5800. High-end models offers up to 300 Gbps of firewall throughput. Some models now include anti-spam capabilities from SOPHOS. Includes new dynamic SSL VPN client delivery capability. The SRX100 Services Gateway is a desktop device, ideally suited for securing small distributed enterprise locations. It consolidates security, routing, switching, and WAN connectivity, and supports up to 700 Mbps firewall and 65 Mbps IPsec VPN. Unified threat management (UTM) features include: antivirus, application security, IPS, antispam, and enhanced Web filtering. The SRX110 Services Gateway consolidates security, routing, switching, and WAN connectivity in small desktop device. It supports up to 700 Mbps firewall and 65 Mbps IPsec VPN, in a single, consolidated, cost-effective networking and security platform. Unified threat management (UTM) features include: antivirus, application security, IPS, antispam, and enhanced Web filtering. It also features a built-in VDSL/ADSL2+ WAN interface, 3G/4G capabilities, and an 8-port Fast Ethernet switch. The SRX110 is ideally suited for securing small branch deployments. The SRX210 Services Gateway consolidates security, routing, switching, and WAN connectivity and supports up to 850 Mbps firewall, 85 Mbps IPSec VPN, and 85 Mbps IPS in a shelf-sized device that can also be mounted in pairs, side-by-side in a rack. Unified threat management (UTM) features include: antivirus, application security, IPS, antispam, and enhanced Web filtering. With wired and 3G wireless connectivity options, the SRX210 Services Gateway is ideally suited for securing small distributed enterprise locations. The SRX220 Services Gateway consolidates security, routing, switching, and WAN connectivity, in an all-in-one, 1RU device that supports up to 950 Mbps firewall, 100 Mbps IPSec VPN, and 100 Mbps IPS. Unified threat management (UTM) features include antivirus, application security, IPS, antispam, and enhanced Web filtering. The SRX220 Services Gateway is ideally suited for securing small to medium distributed enterprise locations. The SRX240 Services Gateway is a 1RU security device that consolidates security, routing, switching, and WAN connectivity, in an all-in-one solution that supports up to 1.5Gbps firewall, 250 Mbps IPSec VPN, and 250 Mbps IPS. Unified threat management (UTM) features include: antivirus, application security, IPS, antispam, and enhanced Web filtering. The SRX240 Services Gateway is ideally suited for securing branch distributed enterprise locations. SRX300: Securing small branch or retail offices, the SRX300 Services Gateway consolidates security, routing, switching, and WAN connectivity in a small desktop device. The SRX300 supports up to 1 Gbps firewall and 300 Mbps IPsec VPN in a single, consolidated, cost-effective networking and security platform. SRX320: Securely connecting small distributed enterprise branch offices, the SRX320 Services Gateway consolidates security, routing, switching, and WAN connectivity in a small desktop device. The SRX320 supports up to 1 Gbps firewall and 300 Mbps IPsec VPN in a single, consolidated, cost-effective networking and security platform. SRX340: Securely connecting midsize distributed enterprise branch offices, the SRX340 Services Gateway consolidates security, routing, switching, and WAN connectivity in a 1 U form factor. The SRX340 supports up to 3 Gbps firewall and 600 Mbps IPsec VPN in a single, consolidated, cost-effective networking and security platform. SRX345: Best suited for midsize to large distributed enterprise branch offices, the SRX345 Services Gateway consolidates security, routing, switching, and WAN connectivity in a 1 U form factor. The SRX345 supports up to 5 Gbps firewall and 800 Mbps IPsec VPN in a single, consolidated, cost-effective networking and security platform. The SRX550 Services Gateway is an all-in-one solution that consolidates security, routing, switching, and WAN connectivity in a 2RU device. It supports up to 5.5 Gbps firewall, 1 Gbps IPSec VPN, and 800 Mbps IPS. The SRX650 Services Gateway is a 2RU device that consolidates security, routing, switching, and WAN connectivity. It supports up to 7.0 Gbps firewall, 1.5 Gbps IPSec VPN, and 900 Mbps IPS. Unified threat management (UTM) features include: antivirus, application security, IPS, antispam, and enhanced Web filtering. The SRX650 Services Gateway is ideally suited for securing regional distributed enterprise locations. The SRX1400 Services Gateway is a professional-grade platform for security ideally suited for small- to mid-size data centers, mobile operator, and enterprise and service provider 10 GbE network environments, where consolidated functionality, uncompromising performance, and services integration, are required. It consolidates multiple security services and networking functions in a highly-available 3RU appliance, and that features a modular design that uses common form-factor modules serviceable from the front panel. It incorporates innovations that improve reliability, enhance network availability, and deliver deterministic performance of concurrent security services at scale. The combination of hardware and software architectures on the SRX1500 delivers very high performance in a small, 1 U form factor. The SRX1500 performs ultra-fast, high-speed firewalling and intrusion protection that can extend to protect end-user devices. Firewall performance remains consistent across different application profiles and usage patterns. Unified threat management (UTM) and intrusion prevention system (IPS) capabilities make it easier to detect intrusions, enforce policies, and proactively mitigate threats to improve the user and application experience. The SRX3400 Services Gateway is ideally suited for medium to large enterprise, public sector and service provider networks. It secures and segments data center network infrastructures, aggregates a variety of different security solutions, and enforces unique per-zone security policies in small to midsize server farms and hosting sites. The SRX3400 is a next-generation security platform that delivers market-leading performance, scalability and service integration, in a mid-sized 3RU form factor. It supports up to 30 Gbps firewall, 8 Gbps firewall and IPS, or 8 Gbps of IPsec VPN, and up to 175,000 new connections per second. The SRX3600 Services Gateway is equipped with a full range of integrated security features that make it ideal for securing medium- to large-sized enterprise data centers, hosted or co-located data centers, and next-generation services and applications. It is a next-generation security platform that delivers market-leading performance, scalability and service integration in a mid-sized form factor. 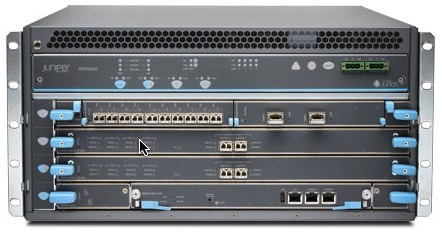 SRX3600 supports up to 55 Gbps firewall, 15 Gbps firewall and IPS, or 15 Gbps of IPsec VPN, plus up to 175,000 new connections per second. The SRX5400 Services Gateway is a next-generation security platform ideally suited for service provider, large enterprise and public sector networks. It is based on a revolutionary new architecture and utilizes new line cards to provide market-leading connectivity, performance and service integration. Its superior price/performance value and small footprint makes the SRX5400 Services Gateway ideal for securing enterprise edges and data centers, service provider infrastructures, and next-generation services and applications. The SRX5400 supports up to 65 Gbps firewall and 22 Gbps IPS, as well as 450,000 new connections per second and 28 million concurrent user sessions. It offers 10GbE, 40GbE, and 100GbE connectivity options. The SRX5600 Services Gateway is a next-generation security platform ideally suited for service provider, large enterprise and public sector networks. It is based on a revolutionary new architecture that provides market-leading performance, scalability, and service integration. Its extraordinary scalability makes the SRX5600 Services Gateway ideal for securing large enterprise data centers, service provider infrastructures, and next-generation services and applications, as well as enforcing unique per-zone security policies. 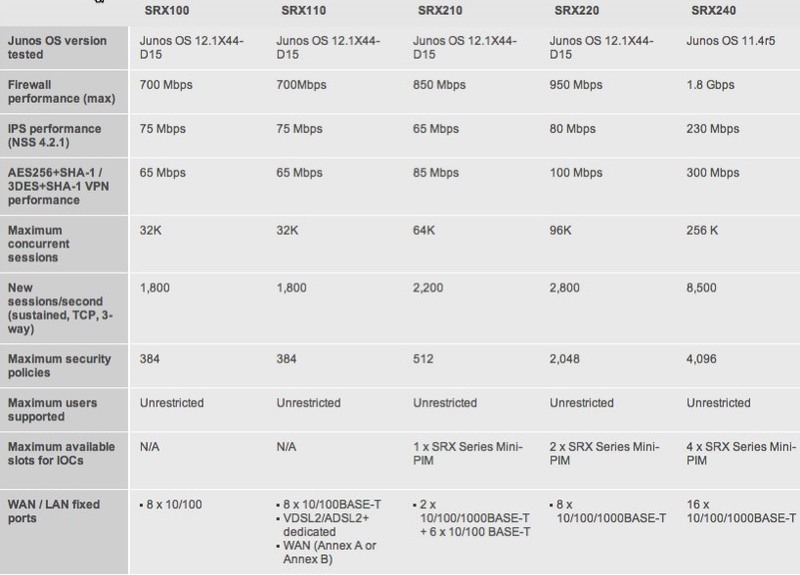 The SRX5600 supports up to 100 Gbps firewall and 50 Gbps IPS, as well as 400,000 new connections per second and 60 million concurrent user sessions. The SRX5800 Services Gateway is an award-winning next-generation security platform that is based on a revolutionary new architecture that provides market-leading performance, scalability, and service integration. It is ideally suited for service provider, large enterprise and public sector networks. The SRX5800 supports more than 200 Gbps firewall and 100 Gbps IPS, as well as 400,000 connections per second, and an industry record-breaking 60 million concurrent user sessions. Equipped with a full range of integrated security features, the massively scalable SRX5800 Services Gateway is ideal for securing large enterprise data centers, hosted or co-located data centers, and service provider infrastructures. SSG series - Excellent product line based on ScreenOS from entry level 160 Mbps to 1+ Gbps. Models include SSG5, SSG20, SSG140, SSG320M, SSG350M, SSG520M and SSG550M. Scales from the SOHO to Enterprise with the same easy to use operating system and user interface. ISG series - First model to include optional integrated IDP (Intrusion Detection and Prevention) in two models offering either 2 Gbps or 4 Gbps of firewall throughput. Models include the ISG1000 and ISG2000 running ScreenOS. The ISG 1000 and ISG 2000 firewalls are available with optional purpose built IDP blades for demanding IDS and IDP requirements. Netscreen series - Original NetScreen product line still includes the two high-performance models that offer 10 Gbps or up to 30 Gbps. Models include the Netscreen-5200 and Netscreen-5400 running ScreenOS. The EX2200, EX2500, EX3200, EX3300, EX4200, EX4300, EX4500, EX4550, EX4600, EX6200, EX8200 and EX9200 series Ethernet switches from Juniper Networks represent a new era in networking. This family of high-performance, carrier-class solutions is designed to address your unique business requirements and create a secure, reliable network that's ideal for today's converged network deployments. EX-series switches are easy to deploy and manage, allowing you to design more energy-efficient networks, with the flexibility to let you innovate with confidence. 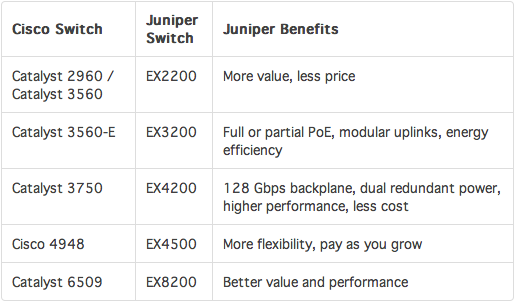 Powered by Junos™ software—the field-tested and customer-proven operating system used by Juniper high-performance routers—the EX-series enables you to roll out new features and applications that will actually enhance your business operations without threatening network performance. Juniper's fixed platform only switches cannot be combined into a Virtual Chassis, we recommend instead purchasing from the Fixed/VC (Virtual Chassis) offerings. EX3200 - Fixed platform. High-performance standalone solution. We recommend either the lower priced EX2200 or the VC (Virtual Chassis) capable EX3300. EX2200 - Fixed platform. 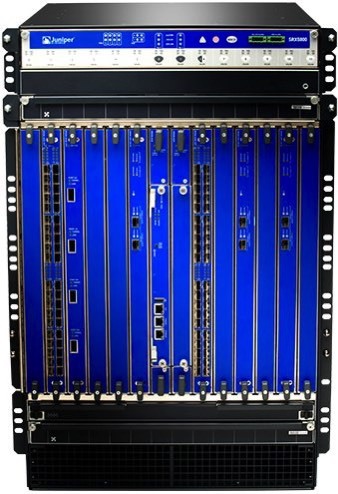 Virtual Chassis configuration consisting of up to four switches over Gigabit ports. Economical price point with high-performance, ideal for access-layer deployments in branch office and campus networks. Comes in a fanless design as well. EX3300 - Fixed platform. Virtual Chassis configuration of up to 10 switches via 10 GbE interconnect. Backplane speed: 40-80 Gbps. Data rate 24 ports: 128 Gbps, 48 ports: 176 Gbps. EX4200 - Virtual Chassis technology and modular offerings with flexibility of stackable switches with high-performance scalability with up to 480 ports in one virtual chassis. Up to 10 switches in a VC with dedicated VCP ports for 128 Gbps Virtual Chassis backplane speed. Data rate 24 ports: 88 Gbps, 48 ports: 136 Gbps. Dual internal power supplies available. EX4300 - Virtual Chassis technology enables up to 10 EX4300 switches to be interconnected over a 320 Gbps backplane using four back-panel 40GbE ports. Works great in standalone VCs and/or mixed with QFX. 320 Gbps Virtual Chassis backplane speed. Data rate 24 ports: 448 Gbps, 48 ports: 496 Gbps. Dual internal power supplies available. HINT: Combine with QFX5100 in a mixed mode VC for high densities of Gigabit and 10 GbE ports. EX4600 - The highly flexible, high-density EX4600 supports up to 72 1GbE ports, 72 10GbE ports, or 12 40GbE ports through installable modules, delivering 1.44 Tbps of Layer 2 and Layer 3 connectivity in a single rack unit. 960 Gbps backplane speed. Data rate 1.44 Tbps. EX4500 - Scalable, compact, high-performance platform for supporting high-density 10 gigabit per second data center, campus and service provider networks. Up to 10 switching in a Virtual Chassis. Up to 128 Gbps (Virtual Chassis) backplane speed. Data rate: 960 Gbps (full duplex). Dual internal power supplies available. EX4550 - The EX4550 Ethernet Switch offers 32 wire-speed GbE or 10GbE pluggable ports in a compact one rack unit base platform. The expansion modules increase the EX4550’s density to 48 wire-speed GbE or 10GbE ports. Up to 10 switches in a Virtual Chassis. Up to 256 Gbps (Virtual Chassis) backplane speed. Data rate: 960 Gbps (full duplex). Dual internal power supplies available. EX6200 - The EX6210 is a 10-slot chassis designed to support a variety of highly flexible network configurations. Two of the slots hold Switch Fabric Routing Engine (SRE) modules, while the remaining eight slots are dedicated for I/O line cards. EX8200 - High performance, high port densities in demanding data center and campus core environments. The EX8208 Ethernet Switch solution has eight dedicated slots in a 14 rack-unit (RU) chassis, delivering up to 320 Gbps per slot and wire-rate forwarding performance of 960 million packets per second for packets of any size. A passive backplane supports future scalability to 6.2 Tbps, providing a built-in migration path to future 100GbE deployments. The EX8216 Ethernet Switch solution includes 16 dedicated line-card slots in a 21 RU chassis and features a switch fabric that delivers 1.92 billion packets per second forwarding. This Ethernet solution also offers the same built-in migration path as the EX8208 Ethernet Switch to support 100GbE environments in the future. EX9200 - The EX9200 line of modular Ethernet switches provides a programmable, flexible and scalable foundation that simplifies network operations and architecture, delivering mission-critical applications in today’s campus and data center core environments. The EX9200 Programmable Switch is capable of supporting current and future SDN interfaces and protocols, offering the flexibility and scalability to increase business agility by simplifying the deployment and operation of cloud applications, server virtualization and rich media collaboration tools across campuses and data centers. Offering fixed-configuration, virtual-chassis, and Terabit-chassis models, all running the same Junos software, the EX-series Ethernet switches deliver the network reliability, integrated security and access control that are essential to today's high-performance businesses. The QFX5100 line of flexible, high-performance, low-latency and feature-rich Layer 2 and Layer 3 switches are optimized for virtualized data center environments. 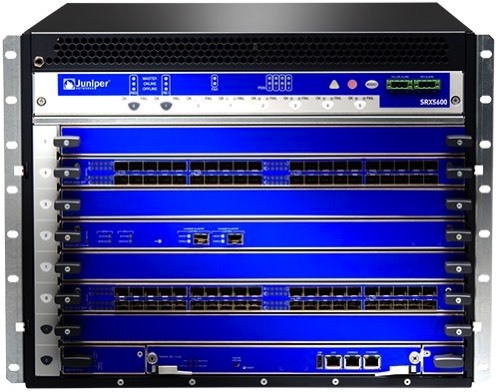 QFX5100 switches are a universal building block for multiple fabric architectures including Juniper’s mixed 1/10/40GbE Virtual Chassis, Virtual Chassis Fabric and QFabric architectures, and open architectures such as Spine and Leaf and Layer 3 fabrics. All QFX5100 switches support In-Service Software Upgrade (ISSU) to deliver hitless data center operations. QFX5100 switches also include support for virtualized network environments including Juniper Contrail and VMware NSX Layer 2 gateway services. TIP: Combine QFX5100 and EX4300 switches in a VC for a mix of high density 10 GbE and high density Gigabit ports. Ask us for details and limitations. QFX5100-48S - A 10GbE switch offering 48 dual-mode, small form-factor pluggable transceiver (SFP/SFP+) ports and six quad small form-factor pluggable plus (QSFP+) 40GbE ports. QFX5100-96S - A 10GbE switch providing 96 dual-mode, small form-factor pluggable transceiver (SFP/SFP+) ports and eight quad small form-factor pluggable plus (QSFP+) 40GbE ports. QFX5100-24Q - A 40GbE switch supporting up to 32 quad small form-factor pluggable plus (QSFP+) ports. Juniper Networks offers a wide variety of firewall routers, including remote or branch class routers on up to multi-service edge routers that scale with proven stability to the world's largest high-performance networks. All Juniper routers run a single JUNOS operating system, meaning that you buy the unit for your requirements and have full compatibility to the large enterprise solutions. NOTE: Choosing the correct or ideal Juniper router depends upon throughput needs, routing table sizes, buffer depth, number of interfaces, media types for the interfaces and other features. 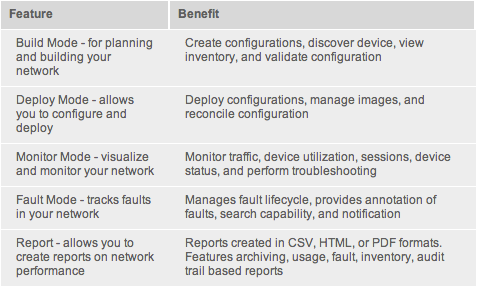 Most enterprise customers needing routing capability will be well served by either Juniper MX or Juniper ACX routers. For service provider and enterprise applications, ACX Universal Access routing platform delivers high performance in demanding space constrained, harsh environments. This makes ACX perfect choice for high-reliability, high-availability, mission-critical communications networks deployed in extreme environments around the world. The vMX virtual router is a full-featured carrier-grade router that offers the same quality and features of the industry-leading MX Series portfolio. The MX5 is a compact 20 Gbps upgradeable router for enterprise applications, space/power constrained service provider facilities and CPEs. The MX10 is a compact 40 Gbps router ideal for enterprise applications and space/power constrained service provider facilities. It is upgradeable to 60 Gbps and 80 Gbps via software license. The MX40 is a compact 60 Gbps router that is ideal for enterprise applications and space/power constrained service provider facilities. It is upgradeable to 80 Gbps via software license. The MX80 is a compact 80 Gbps router ideal for enterprise applications and space/power constrained service provider facilities. The 80 Gbps MX104 supports control plane redundancy and is optimized for Ethernet aggregation, and enterprise applications. The modular MX240 offers almost 2 Tbps of system capacity for cloud and enterprise data centers and campus deployments, service provider edge networks and the mobile service core. The modular MX480 delivers over 5 Tbps of system capacity for cloud and enterprise data center and campus deployments, service provider edge networks and the mobile service core. The modular MX960 delivers over 10 Tbps of system capacity for cloud and large enterprise data centers, service provider edge networks, and the mobile service core. The modular MX2010 offers over 17 Tbps of system capacity to accommodate long-term broadband traffic, subscriber, and service growth in service provider networks. The modular MX2020 is the highest capacity single chassis edge router in the industry, supporting extremely high density 10 Gbps/100 Gbps interfaces and system scale through 80 Tbps. ACX1000 Universal Access Router offers an entry-level configuration and is ideal for cabinet and tower deployment. ACX1100 Universal Access Router is an Ethernet-only configuration, ideal for external cabinet or tower installation. ACX2000 Universal Access Router is a versatile access platform that is 10GbE capable with 16 T1/E1 interfaces. The ACX2100 Universal Access Router is a fixed port configuration and 10GbE capable with more SFP ports. ACX2200 is a hardened, Ethernet-only high capacity router optimized for LTE and LTE-A. ACX4000 Universal Access Router carries two modular interface cards, making it versatile for any deployment. Juniper SRX firewalls run the Junos OS and include routing support for OSPF, BGP, RIPv1, RIPv2 and Multicast. Juniper EX and QFX switches run the Junos OS and include routing support for OSPF, BGP, RIPv1, RIPv2 and Multicast. Simplifies network operations by unifying wired and wireless management for complete life-cycle of management of campus and data center networks from a single pane of glass. •	Critical elements of advanced management applications by providing operational efficiency, expedited error free service roll-out, enhanced visibility and fast troubleshooting. •	Operational efficiency by employing a correlated view of various networks elements. It offers a holistic view of every aspect of network operation to remove the need for disjointed applications throughout the lifecycle of the network. •	Faster roll-out and activation of services while protecting against configuration errors with profile-based configuration and configuration pre-validation. •	Single pane of glass management that provides a unified view of the network infrastructure including a correlated view of overlay services and user experience on top of network infrastructure. Junos Space Network Director also tracks aggregated utilization, network hotspots, failures, correlated RF data and usage to a user level providing deep visibility and easy troubleshooting of connectivity, equipment and general failures. Helps organizations improve the reach, ease, and accuracy of security policy administration with a scalable, GUI based management application. •	Scale security policy across multiple Juniper Networks SRX Series Services Gateways, or manage multiple LSYS instances on a single SRX Series device. •	Centrally configure and manage application security (e.g., AppSecure), firewall, VPN, IPS, and NAT security policy through one scalable management interface. •	Define and enforce policies for controlling usage of specific applications such as Facebook, instant messaging, and embedded social networking widgets through included AppFW management. •	Reuse security policies within Junos Space Security Director for improved security enforcement accuracy, consistency, and compliance. •	Build the infrastructure for further management innovation across the network through open and secure Junos Space Network Management Platform integration. 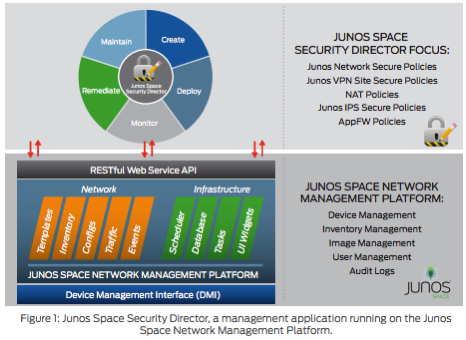 *NOTE: Junos Space Security Director was previously called Junos Space Security Design. Ensures error-free service provisioning and monitoring of legacy Carrier-Ethernet and MPLS using a simple interface to design, validate and manage these services. A remote, automated trouble-shooting client that enables Juniper to quickly identify a problem in the customer's network to achieve a 40% increase in Day 1 issue resolution. Comes with the Junos Space Network Management Platform. Reduces network downtime by delivering proactive bug notifications specific to your network configuration, and thorough automated end-of-life/support analysis where you can do complete EOL auditing across 100's of devices in seconds. Comes with the Junos Space Network Management Platform. Speeds and simplifies deployment and configuration of Junos Content Encore through the network, with a centralized caching management solution that scales to manage hundreds of caches from a single server. Helps you ensure smooth operations in virtualized data centers by provisioning, defining, and deploying end-to-end policies on both virtual and physical networks, all from a single location.